BELGRADE – After this morning’s meeting of representatives of the National Convention on European Union and the Ministry of Defense, regarding the proposal for a Regulation in the areas of scientific and other research of importance to the defense of the country and the manner and procedure for granting authorization to carry out these studies, together with foreign persons or for the needs of the foreign staff, it was decided that the adoption of this proposal will be paused. The announcement how this draft regulation will be adopted has provoked reactions from the scientific community and representatives of civil society . Civil society representatives at the meeting included Sonja Stojanovic-Gajic, Director of the Belgrade Center for Security Policy, Natasa Dragojlovic, Coordinator of the National Convention on European Union, Sonja Licht, President of the Belgrade Fund for Political Excellence, Natan Albahari, Program Manager at ISAC Fund and Milan Antonijevic, Director of YUCOM. As Antonijevic explained to the European Western Balkans, this morning at the meeting of the National Convention on European Union and the Ministry of Defense, which was attended by Minister of Defense Zoran Djordjevic, agreed to pause the adoption of proposed regulation. “We should instead be talking about a law that would regulate the issue of critical infrastructure which needs to be protected, within which areas where should be no research are defined,” said Antonijevic. He points out that this issue concerns freedom of the academic community and civil society to research in certain areas and that in comparative practice such solutions do not exist. “The meeting repeated requests from initiatives launched by the National Convention, and pointed to many projects and initiatives implemented in cooperation with European universities, the program Horizon 2020, which is very important for science, as well as the case of scholar Magdalena Djordjevic who has obtained over one million euros for research in the field of physics. All this research would not be possible if the regulation existed in the form in which it was planned, “said the director of YUCOM for EWB. Minister of Defense gave the task to his associates to take into account the views of civil society representatives. “We will try to find a solution that will be in the best interests of our country, scientific and research community and citizens,” said Minister Djordjevic. 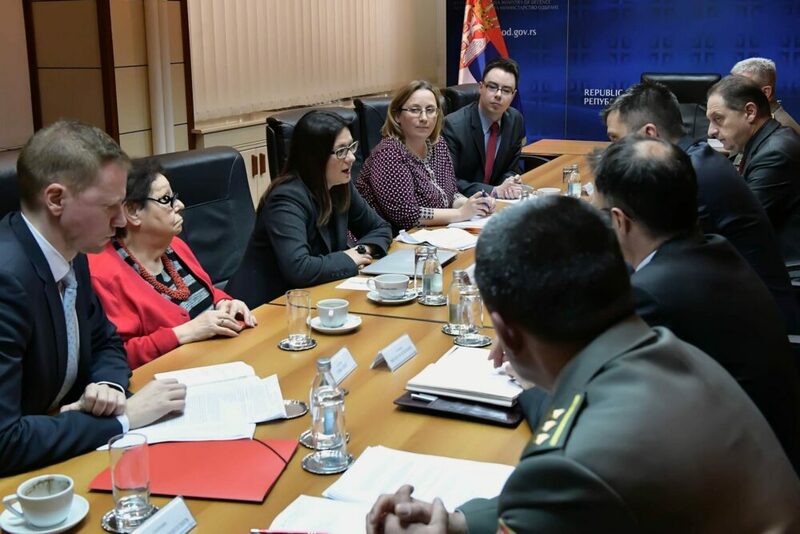 According to the announcement, the Coordinator of the National Convention on EU Natasa Dragojlovic emphasized the current excellent cooperation and civil society organizations with the Ministry of Defense. “I am convinced that the Ministry of Defense will continue to recognize and respect the views of non-governmental sector and that, as before, reasoned dialogue will lead to high-quality results,” said Dragojlović. The National Convention stressed previously how application of these provisions derogates a number of constitutionally guaranteed rights, such as freedom of scientific and artistic creativity (art. 73), autonomy of universities (art. 72), freedom of opinion and expression (art. 46) , the right to information (art. 51), freedom of association (art. 55), freedom of entrepreneurship (art. 83), free and equal market position (art. 84). The regulation is in conflict with the constitutional standards set out in Article 20, which guarantees that the achieved level of human rights can not be reduced, it was pointed out in the initiative.